Well I'm still in a back-to-school mode, and from past experiences this will be going on for a few more weeks. I settle in when the kids do. Once routines have been established and we have all fallen into our daily schedule, the school day becomes easier for us all. I have 10 students again this year from k-3. We started our year with a general theme on ladybugs. In math, we have done math facts, odd and even numbers with them, and forward and backward counting. Next week we will be doing doubles, doubles plus 1 and 2 and hopefully at some time also cover the subtraction strategies that go with them. 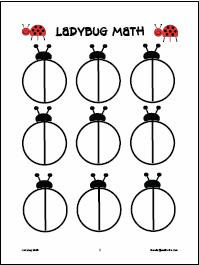 I also have an activity set with ladybugs which comes from Spectrum Math. I got it last year and mislaid pieces of it so I couldn't use it. That is actually what brought on my theme. I found the missing pieces when doing the big clean up and planning began. We now have a ladybug farm in our class which is interesting to watch, even for me. Still, I can't wait to set the poor critters free. Though I might be convinced to keep them and see if they actually hibernate. This site has among other great math activities, a set themed around ladybugs. I found this glyph activity there. Of course there's always Eric Carle's The Grouchy Ladybug, which I used to introduce the theme. It gives a good intro to ladybugs and aphids. Interestingly after searching for some ladybugs for a few days, it was the students who found many on aphid infested Canada thistle. Other then school, I have been busy gathering herbs for tea and for winter projects. Hopefully I will still be able to gather chickweed for salves and more stinging nettle for our tea supply. Seen from left to right, ground ivy, yarrow, anise hyssop, and field mint. Except for the ground ivy which is taking over the grass in our backyard, these are picked in the fields. Close up view of the anise hyssop. and a white dahlia, new for this year and so pretty. I thought for a moment the Joe Pye weed was bee balm. Leaves seem similar. Its nice never seen it before.